Malek Ž, Geijzendorffer IR, Bondeau A, Cramer W, Verburg PH. 2018. 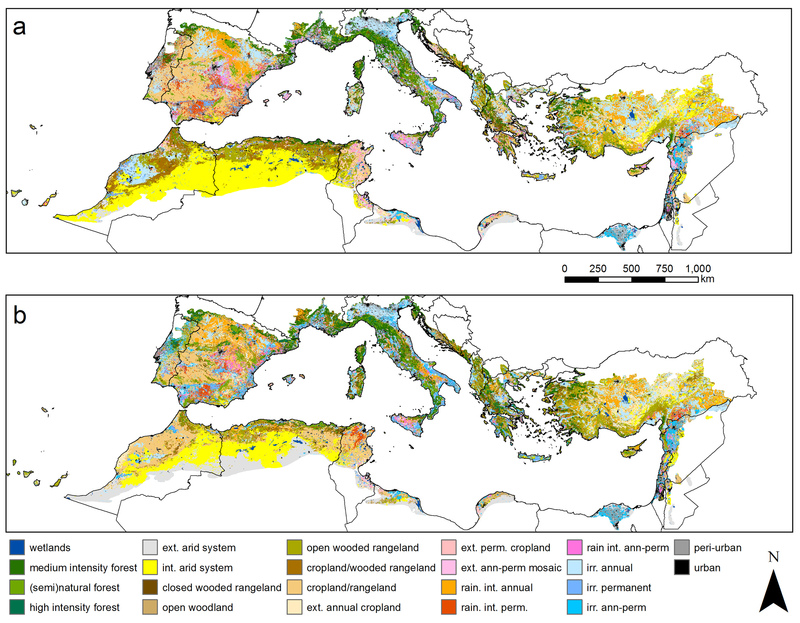 Global change effects on land management in the Mediterranean region. Global Environmental Change 50, 238-254. Malek Ž, Verburg PH. 2017. Adaptation of land management in the Mediterranean under scenarios of irrigation water use and availability. Mitigation and Adaptation Strategies for Global Change. The Mediterranean region faces significant challenges to supply its growing population with food and living space. The region’s potential to do so in the future is even more uncertain in the light of global change effects, particularly climate and socio-economic change. Until know, it was unknown how land use and land management can respond to such global challenges. We present a set of scenarios on potential future changes to Mediterranean land systems. First, we present two different pathways in fulfilling the growing demand for crops, livestock and urban space. One is oriented towards growth, without any restrictions in terms of limiting the withdrawal of water for irrigation or expansion of protected areas. The second presents a future, where consumption of water for irrigation is reduced, and the network of protected areas is significantly expanded.The second set of scenarios presents how land use and land management might respond to different levels of reduced water losses in the irrigation systems. Irrigated cropland in the region is characterized by different levels of efficiency. In the study we show, that significant reductions of water losses is necessary in order to increase crop production in the region. We used the CLUMondo model in both studies. We present a novel approach, where we limit cropland intensification based on accessible water resources. Moreover, we studied what would decreases in water resources due to climate change mean to land use and land management.